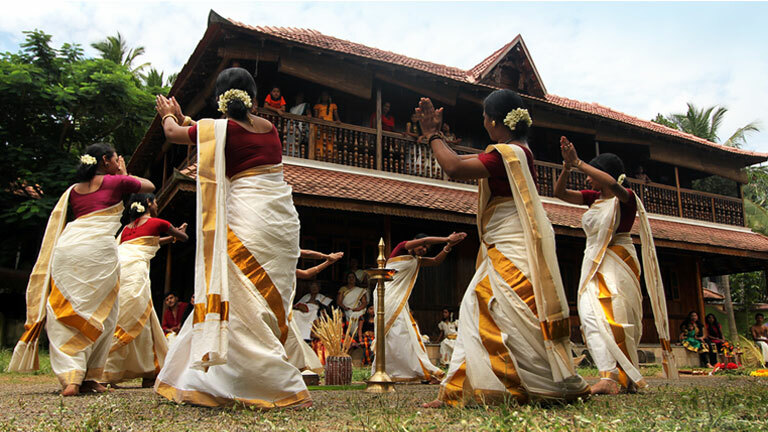 Thiruvathirakkali gets its name from its association with the popular dance form, the Thiruvathira. The Athira festival is religiously observed by the women of Kerala during the full moon day of the bright lunar fortnight of the Malayalam month of dhanu – a day which falls under the Thiruvathira star. It is believed that being pleased with Parvathi’s extraordinarily austere tapas in his meditation, Lord Shiva appeared to her on Thiruvathira day and granted her, her wish to be his consort. The first Thiruvathirakkali was held as part of the celebrations to mark this happy occasion. Today, during this auspicious day, in commemoration of the divine union of Shiva and Parvathy, young, women wear white clothes, flowers in their hair and sing and dance together. The songs that are sung during the Thiruvathirakkali are known as Thiruvathirakkalippaattu. Since the dance steps are always accompanied by clapping, the dance is also referred to as Kaikottikali (clap dance).